Recently opened is &quot;Quilt Square Girls&quot; here is West Jefferson in the formerly old Shoe Shop building located at 5 East 2nd Street.&nbsp; Syndi and Renee Brooks have renovated&nbsp; the building and now it&#39;s as quaint and charming as can be. It&#39;s a combination workshop, gallery, and lounging area complete with sofa and coffee table. 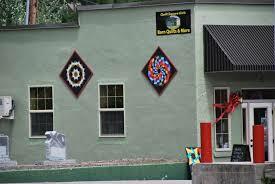 From this location they create the colorful barn quilts one observes not only on barns but houses and other structures throughout Ashe County and the High Country.&nbsp; Many of their creations travel many miles before finding their home. People have them&nbsp; paint the barn quilts for many reasons: memorials to loved ones who have passed, cherished memories&nbsp; that one had as a child, or to celebrate hobbies or just to express individually. 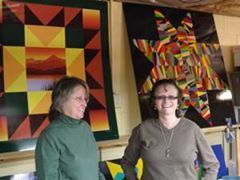 The crafted squares can be hung indoors or outdoors. Whatever the reason or wherever you choose to hang them they have become beautiful public displays of art. The cost for a basic pattern at 2 feet by 2 feet begins at $65, but the price does increase with more complex patterns and larger sizes. &ldquo;The shortest time it takes to complete a barn quilt is about a day, and the longest most complicated patterns can take up to two weeks or more,&rdquo; Renee said. Individuals who would like to purchase a barn quilt as a gift, including for Christmas, should allow eight to ten weeks for order completion due to a back log, Syndi said. However, gift certificates are available. Visit their website www.ilovebarnquilts.com and view many of their designs. Let A1 Mountain Realty be your guide to the residential, land and commercial real estate sales in Western North Carolina. We feature North Carolina Mountain Real Estate and Blue Ridge Mountain Real Estate. In addition to the great service we provide we are also local. We are located in the center of the Arts District in Downtown West Jefferson and because of this we know our area intimately. Everyone knows when buying a house you&#39;re also buying the neighborhood. Our knowledge will help you find which area would be best suited for your lifestyle. Visit our website www.a1mountainrealty.com and view all of our listings or doing a MLS search for any High Country Real Estate.